This January the King’s Fund published a report discussing what can be done to enable faster adoption and spread of innovation in the NHS. The report, commissioned on behalf of the AHSN Network and written by Ben Collins, charts the journey of eight innovations from creation to widespread use. One innovation highlighted was the Emergency Department Safety Checklist, which we supported. Amongst the eight innovations were ESCAPE-pain, a rehabilitation programme for people with chronic joint pain; ChatHealth, a service enabling young people to contact school nurses via text message and a programme to identify early signs of liver disease. The innovation we supported was the Emergency Department Safety Checklist, developed by Dr Emma Redfern, a consultant in emergency medicine at University Hospitals Bristol NHS Foundation Trust. In 2014 Emma became concerned about how her emergency department was coping during times of overcrowding. To combat this she developed a list of simple checks staff should complete, such as taking people’s pulse and blood pressure, and checking for sepsis and heart problems. This would ensure no essential checks were ever missed, even during times of overcrowding, and that signs of a deteriorating patient would be quickly recognised. 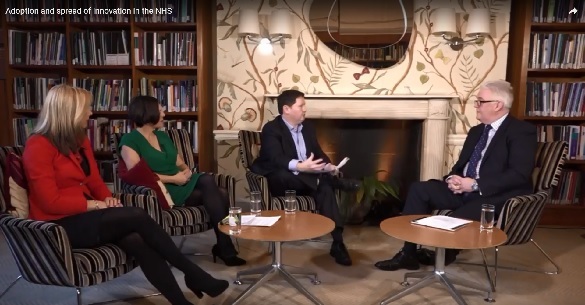 In the report, Ben points out that while some of the innovations appear relatively simple, the main challenge for innovators was creating culture change in such a highly complex organisation as the NHS. Introducing innovations often inevitably caused a domino effect, triggering huge changes to staff and patient roles. Implementing these wider changes then required a large amount of time and resources. The next major challenge was the funding gap. The NHS sets aside less than 0.1% of resources for the adoption and spread of innovation, meaning finding even relatively small sums of money to implement change was a significant barrier. The report identifies that the success of these innovations largely depended on the innovators being prepared to step out of their remit of work and generate collaboration. Successful innovations require boots on the ground, which means funding for experienced project teams as well as senior, credible clinicians to convince colleagues of the benefits of innovation. Read the report in full here or watch the video discussion here.